This is no ordinary meditation and yoga retreat. What makes it unique is the blend of experiences you receive. Beginners and advanced people get to explore mind and body by getting to the heart of yoga and meditation, each complementing and enhancing the other. It's a unique formula that gives you a new lense to look at life with greater perspective and clarity. And you get to place the emphasis where you like — more yoga and action, more meditation and tranquility, or even just giving yourself that extra time to relax poolside. It's the ultimate mind body retreat. 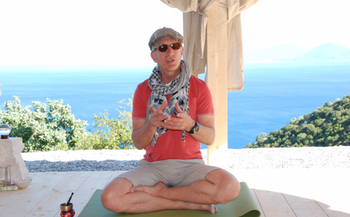 Meditation is easily accessible when presented by highly experienced teacher, Brian Hilliard. The initial challenge soon gives way to genuinely transformative experience. You will discover how meditation offers secret keys to yoga practice. Beginners will appreciate yoga’s emphasis on increasing strength and flexibility. All yogins will explore how yoga is a gateway to enhancing our understanding of ourselves emotionally, intuitively and intellectually. Active and passive yoga, yang and yin, appeal to different personality types, and are offered in a balanced way. Get to the heart of yoga and discover how it supports meditation. The way of using the pure sounds of crystal bowls atunes us to the natural state of well-being through vibration. Vibration and sound is found everywhere, but what is especially effective about crystal bowl resonance is their pure and beautiful quality of sound. It atunes us to ourselves by magnetising us and getting us on it’s frequency. It atunes us to our innate healthiness and wholeness. This unique formula, blending yoga and meditation, is presented by highly experienced teachers. Brian Hilliard has 35 years of experience, and his yoga instructor team teach from great depth of experience. With this kind of expertise you relax, learn, get what you need, and become your own teacher. We create an atmosphere that is light and caring, and free of unnecessary concerns. Immersed in nature, each retreat venue is carefully chosen by Shannon & Brian to enhance your experience. You deserve a holiday with delicious and healthy food — the perfect sustenance for meditation and yoga. Accommodation is simply luxurious. Whether at the sea, the countryside, desert or riverboat, we take care of you so that you can relax and fully absorb the experience. Processing your experience in intimate groups is both enlightening and fun. Group interactions help to make sense of your experience, placing it in the context of daily life. With new and old friends, celebrate in the spirit of universal wisdom. We dedicate plenty of time to teaching you how to continue the spirit of the mind body retreat in daily life. Your professional and life talents are put together in the mix of yoga and meditation. You get practical guidelines for daily life and the opportunity for ongoing support, when you need it. "... I miss being there and how much I got out of the retreat. It also turns out that my pre-conceptions were wrong – meditation is for everyone, and not just for coping with stress. Anyone can better develop their potential using these techniques."